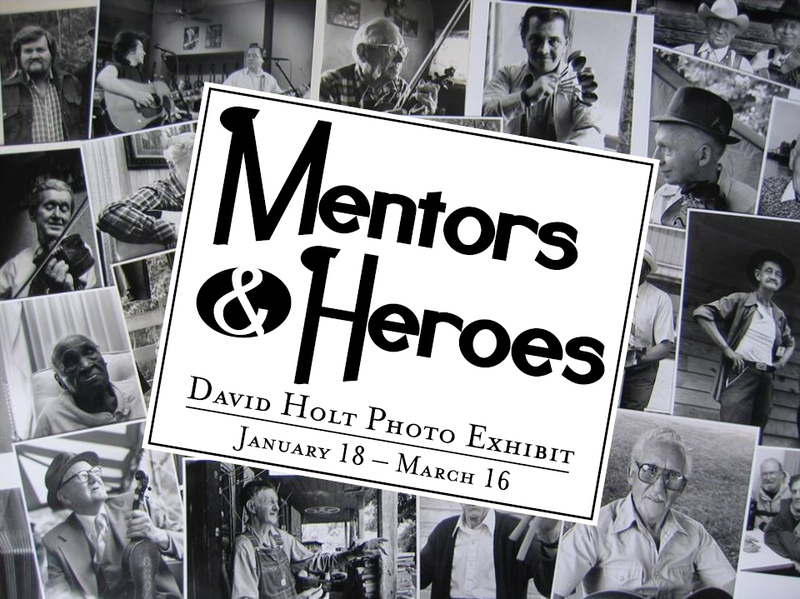 "Mentors and Heroes: David Holt Photo Exhibit" opening January 18 will run through March 30 and includes over thirty framed black and white portraits of David Holt's many musical mentors and heroes from the 1970s to the early 2000s. The exhibit also includes several instruments from Holt's personal collection. David Holt is a musician, storyteller, artist, historian and radio and television host who has collected and performed the songs and stories of the Blue Ridge Mountains for more than forty years. Included in these photos are icons such as Doc Watson (whom David considered his musical father), Surry County's Tommy Jarrell and Fred Cockerham, Etta Baker, and Earl Scruggs, as well as musicians who, while not well known, were influential in David’s life.